LASTS ALL YEAR. GUARANTEED! * Get organized with this 1 1/2" binder, featuring a three-pocket expanding file and an exterior zipper pocket that securely stores small items. Its durable plastic interior protects your school work. At the same time, this binder is water resistant, giving it an added layer of protection against every day wear and tear. Binder rings hold up to 300 sheets of 15 lb. filler paper and expanding file 200 sheets. The overall size of the zipper binder is 12 3/4" x 11 1/4". 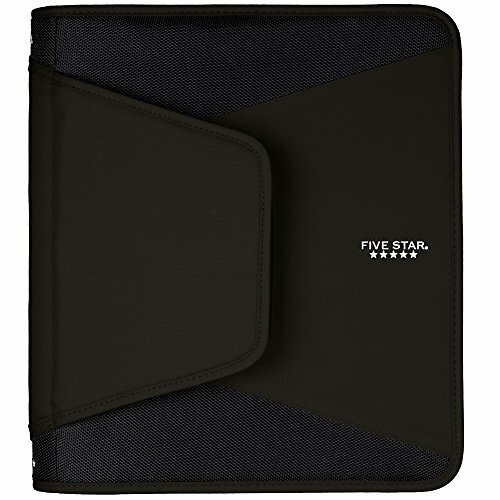 *ACCO Brands will replace any Five Star binder that is returned within one year from the date of purchase. This guarantee does not cover damage due to misuse or abuse. Contact ACCO Brands Consumer Affairs for instructions. Its durable plastic interior protects your school work. At the same time, this binder is water resistant, giving it an added layer of protection against every day wear and tear. Binder rings hold up to 300 sheets of 15 lb. filler paper and expanding file 200 sheets. Overall size of 12 3/4" x 11 1/4". Binder comes in Black.